Researchers have been unclear on how bacteria form and release certain extracellular components involved in cell adhesion and multicellular structures that also contribute to antibiotic resistance. 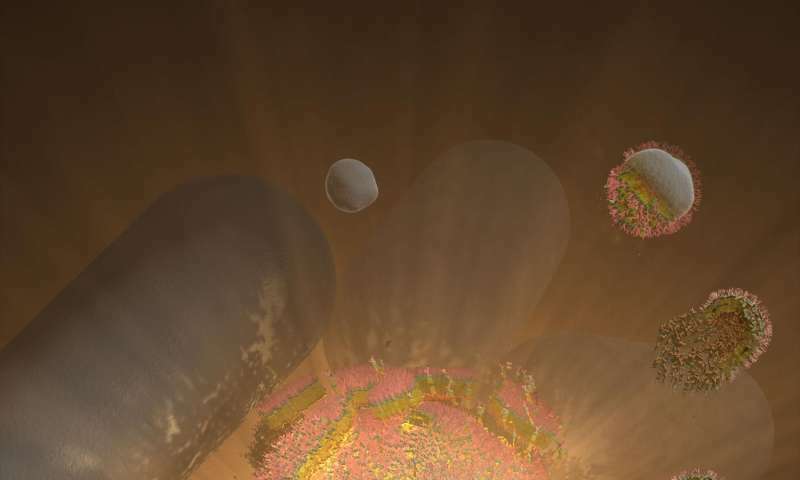 However, a recent study from a multinational team of researchers identified a previously unknown phenomenon, explosive cell lysis, as crucial in the production of membrane vesicles and biofilm formation. The study was reported in Nature Communications. Membrane vesicles are tiny spheres that develop from bacterial membranes and contain a mixture of proteins, DNA, and RNA. They are important for the virulence of the bacterium—its ability to cause disease—as they play vital roles in invasion, secretion, and signaling. They also contribute to the formation of biofilms, the slimy three-dimensional structures that form when bacteria adhere to moist surfaces such as teeth or wounds. Extracellular (e)DNA is a key structural organization of biofilms, yet it was not known how certain structural proteins or eDNA are released.